Back in 2013 I wrote about a company called Ethical Electric, noting that the electricity supplier was charging a premium to help out progressive causes. Well, the other day I received a solicitation from a group called Clean Energy Option and after a little digging I found out it was Ethical Electric that was doing business as (d/b/a) Clean Energy Option. Seems to be less than ethical to change their name, but it’s likely a marketing thing. Yet thanks to that 2013 piece I wrote for Watchdog Wire, I found out that Ethical Electric was charging 10.14 cents per kilowatt-hour (kWh) at the time, which was a fair-sized premium over the 8.89 cents per kWh Delmarva Power (my utility) was charging back then. That 14% difference meant the average bill would be about $12.60 higher per month for an average home that used 900 kWh monthly. I don’t know about you, but I’m sure I would cry foul if my electric bill was going up $150 a year, since that’s what it translates to. In short, supporting new renewable energy development costs a little more than delivering polluting energy. That’s because the energy you are choosing is better for you and the planet. There’s obviously something at work here to drive the cost of “regular” electricity down while wind and solar continue to increase. I suspect that something is the low cost of natural gas, which is used more frequently as an energy source to create electricity and is relatively cheap. Ironically, this economic fact is doing almost as much damage to the coal industry as Obama’s EPA regulations. So don’t be fooled to the tune of $23 a month or nearly $280 a year. Keep the money in your pocket and stick with what is most reliable. Or, if you really want to put that money to work, use it to support elected officials who will stand up to the environmentalist lobby and remove these silly mandates and carveouts for the otherwise unsustainable green energy racket. Last month’s wind-turbine fire near Palm Springs, CA, that dropped burning debris on the barren ground below, serves as a reminder of just one of the many reasons why people don’t want to live near the towering steel structures. In this case, no one was hurt as the motor fire was in a remote, unincorporated area of Palm Springs. But imagine if it was located just hundreds of feet from your back door – as they are in many locations – and the burning debris was raining down into your yard where your children were playing or onto your roof while you are sleeping. A similar study done in Henderson, NY, found a proposed wind project could have “a total loss in property value of up to about $40 million because of the view of turbines.” An interesting feature of the NY study, not addressed in the NC one is how the loss in property taxes, due to reduced values, will be made up. The Watertown Daily Times points out that most of the homes whose values “would fall sharply due to the view of turbines” are “assessed above $1 million.” It states: “homes in the $200,000 range without a view of turbines would probably see an increase in property taxes to make up for the overall drop in property values.” Robert E. Ashodian, a local resident is quoted as saying: “If property values go down and the town isn’t going to spend less money, the tax rate is going to go significantly up for all of the homeowners who aren’t impacted.” Henderson Supervisor John J. Calkin expressed concern over the “devastating impact” the wind project would have on the town and school district. Offshore wind turbines were supposed to offer a visual benefit, but they, obviously, bring their own set of problems. Then, there are the U.S. utility companies who are forced to buy the more expensive wind-generated electricity due to an abused – but little known in the public – 1978 law that was intended to help the U.S. renewable energy industry get on its feet. The Public Utility Regulatory Policies Act (PURPA) was designed to give smaller power players an entry into the market. If wind-turbine projects meet the guidelines, utilities must buy the electricity generated at “often above-market” costs. Instead, in many cases, big projects, owned by one company, get divided up into different parcels with unique project names, but are still owned by the major developer. Energy Biz magazine reports: “PacifiCorp, for one, estimates that such abuses will cost its customers up to $1.1 billion in the coming decade by locking the company into unneeded electricity contracts at rates up to 43-percent higher than market price.” It quotes John Rainbolt, federal affairs chief for Wisconsin-based Alliant Energy: “Our customers essentially pay for PURPA power at 20-percent higher-than-market-based wind prices.” Led by Senator Lisa Murkowski (R-AK), Rep. Fred Upton (R-MI) and Rep. Ed Whitfield (R-KY) a move is underway in Congress to review the nearly 40-year old legislation. So, residents who live near wind turbines don’t want wind turbines. Nor do residents and renters who have them in the viewshed, governments looking to cut costs, utility companies, or ratepayers. And we haven’t even mentioned those who want to protect birds and bats. Scientific American just addressed the concern that “Bat killings by wind energy turbines continue.” It claims: “wind turbines are, by far, the largest cause of bat mortality around the world” and this includes three species of bats listed – or being considered for listing – under the Endangered Species Act. Bats are important because they eat insects and, therefore, save farmers billions of dollars in pest control each year. Scientific American reports that in addition to dead hawks and eagles found under the wind turbines are thousands of bats. 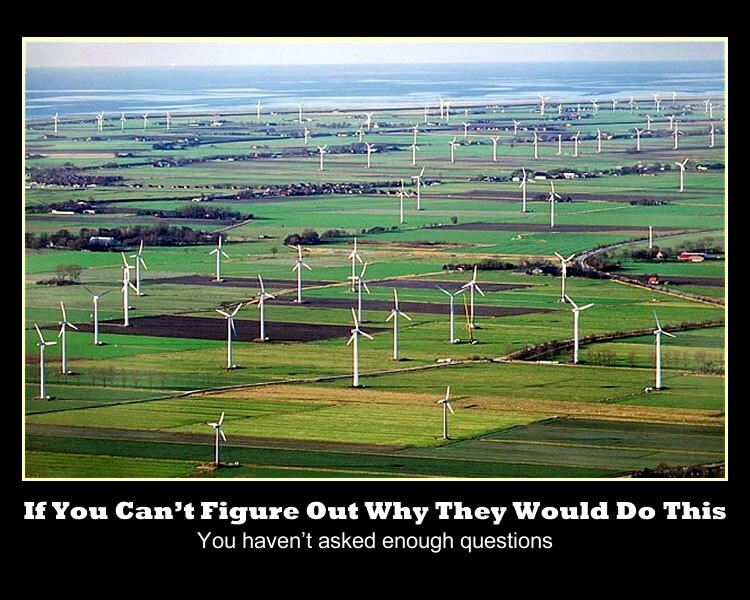 Who does want wind turbines? If no one but the rent-seeking crony capitalists want wind turbines, why must people like Minnesota’s Langrud have to endure them? Because the wind energy lobby is powerful and “green energy” sounded good decades ago when the pro green-energy policies like PURPA were enacted. However, as the Bloomberg story on Demark points out: wind power is “a mature industry that no longer needs state aid.” Unfortunately, in December 2015, Congress extended the wind energy tax credits through 2021. But tweaks, such as reforming PURPA, can take place and a new president could totally change the energy emphasis – which would be good, because, it seems, no one really wants wind turbines. Flip-flopping like a fish on a hook, Barack Obama once again turned the spigot off on the prospect of oil and natural gas exploration offshore in the Atlantic Ocean. It proves once again that the claims he’s made advocating an “all-of-the-above” energy policy are just more lies and that he’s not interested in helping our nation prosper by tapping into its vast energy resources. It also proves that those who use the scare tactics of making people believe that oil spills are a daily occurrence, rendering the Gulf of Mexico a permanently fouled body of water, have managed to grab the attention of the powers that be. Consider the opposition that was drummed up to offshore seismic testing over the last few years as oil exploration was considered – but not a peep when it was done to locate sites for wind turbines. Either marine life is important or it isn’t. It’s been my contention that the defense of “well, there really isn’t that much oil out there to bother with” is conveniently based on information that’s 30 to 40 years old, and as technology has improved the amount of oil believed to be recoverable invariably goes up. We could have far more available to us than we have been led to believe, and I think that is what scares the environmentalists more than the (very remote) prospect of an oil spill. The larger the oil supply, the more reasonable the price and the less incentive to turn our energy future over to unreliable solar and wind power. So why does this tick me off so much? As I see it, America is in a position where we can be energy-independent to the extent that we need not import from overseas. Our continent has plenty of resources if we just get the desire to use them to both power our capitalist system and create thousands of good-paying jobs. It’s all about creating value, and a resource that is useless to us if kept in the ground becomes the fuel for our economic engine once extracted. A barrel of oil could be used in so many ways – as fuel, a lubricant, raw material for plastics, and so forth. Our usage of it assigns its value, and we use that resource to create still more value, whether through transport, extending the life of components, molded into consumer products, or traded as an export. We also use natural gas to create electricity, particularly as a backup fuel for those frequent times when wind or solar power is unavailable. For all its uses, electricity is not as easily transported as oil or natural gas is – normally there’s a loss of a few percentage points for long-distance electricity transport. Taken to a local level, anything that can diversify the economy from chicken, government jobs, and tourism should be encouraged. We have been sold the pie-in-the-sky promise of being a leader in building wind turbines, but there’s no real market for that without a hefty subsidy. So we’re not building them. I don’t think we will have the saturation level of energy jobs that are present along the Gulf Coast, but even if it’s in the hundreds that would be an economic shot in the arm for the region. Thus, the news this week of yet another delay in Atlantic drilling means a longer economic drift for the region. It also gives the environmentalist wackos – most of whom are from out of the area and don’t care about anything but our financial support – more of a platform to try and drive other businesses away, such as the poultry industry. Their ultimate goal is Delmarva as a “wildlands corridor,” because as you know people are a burden to this earth. Here’s hoping the new administration points things back in the right direction and allows the energy companies to get a foothold offshore. Let’s see what’s really out there. In the post I recently did about wind power, I pointed out that beginning in 2017 Maryland electric ratepayers will begin a 20-year process of chipping in $1.7 billion in subsidies to the developer of an offshore wind farm off the Ocean City or Assateague coast. Yet a new study claims that Maryland could reap far greater economic benefits over the next two decades if offshore drilling is allowed in the region, with even larger payoffs for Virginia and the Carolinas by virtue of their longer coastlines. Nearly as important are the thousands of jobs which could be created – something wind energy producers can’t match. There’s no doubt that these rosy scenarios presented by Dr. Timothy J. Considine of the University of Wyoming and the Interstate Policy Alliance (which includes the Maryland Public Policy Institute) were made up to encourage the loosening of restrictions on offshore drilling. Yet they also take into account the cost of environmental factors in a reasonable way, which balances the picture. It turns out that Maryland is one of the better cost/benefit performers of the six states (Delaware, Georgia, Maryland, North Carolina, South Carolina, and Virginia) included in the study. It also goes without saying that our Senate representatives are foolishly dead-set against the idea, signing onto an August letter which claimed detrimental effects on tourism in the highly unlikely event of an oil spill. (A few Maryland House members signed a similar letter.) While tourism is a good thing and we’d like to encourage more of it, the value which could be added to our economy from oil and natural gas is far greater. At this early stage, the next move seems to be simply testing to update decades-old mapping which suggests there’s a potential for millions of barrels of oil offshore. Any actual drilling is probably years and several court battles away, as it’s almost a guarantee that Radical Green will throw the legal kitchen sink at any attempt to drill for oil in the Atlantic. May I kindly suggest they go pound sand. But if they insist on building wind turbines offshore, it should be noted that oil rigs and wind turbines can coexist and once the oil is tapped out the platforms can be put to good use. These uses don’t have to be mutually exclusive, but in terms of current economics it’s difficult to match the high subsidies required to get companies to even consider offshore wind when compared to the clamor of energy producers to see just what’s underneath all that Atlantic coastline. If Larry Hogan really wants the “all of the above” energy approach, he should embrace the prospect of offshore oil exploration.